In Turkey, both for motorcycles, cars and vehicles over 3.5 tons, charged passage of some highways and bridges. It is a highway sections in the vicinity of Istanbul, Ankara, Adana, Izmir, Gaziantep and bridges Osmangazi, Fatih Sultan Mehmet, Temmuz Şehitler and ​​​Yavuz Sultan Selim. Toll collection takes place at toll gates by HGS chip sticker or OGS toll unit. Prices tolls are derived from the length of toll roads and the type of vehicle that is not determined according to its weight, but according to the number of axles. Additional information, including indicative prices of tolls and links to the official website can be found below. The toll is collected electronically in Turkey by wireless chip sticker on the registered vehicle registration number or by electronic on-board unit. For more information see pages HGS (fast pass system) and OGS (auto pass system). For people with limited mobility may not be ready no way to ask for a discount on tolls for crossing the Turkish highway sections. For drivers of vehicles weighing over 3.5 tonnes are for payment of toll was determined the same rules as drivers of motorcycles and cars weighing up to 3.5 tons. Contrary to common practice, not vehicle categories divided according to weight, but according to the wheelbase and number of axles. TABLE vehicle categories can be found at the top of this page. Dear sirs I will be driving within a week to Istanbul,,can you tell me how much tolls i will pay on O-3 otyoul from Kigali intersection to Mahmutbey exit each way. 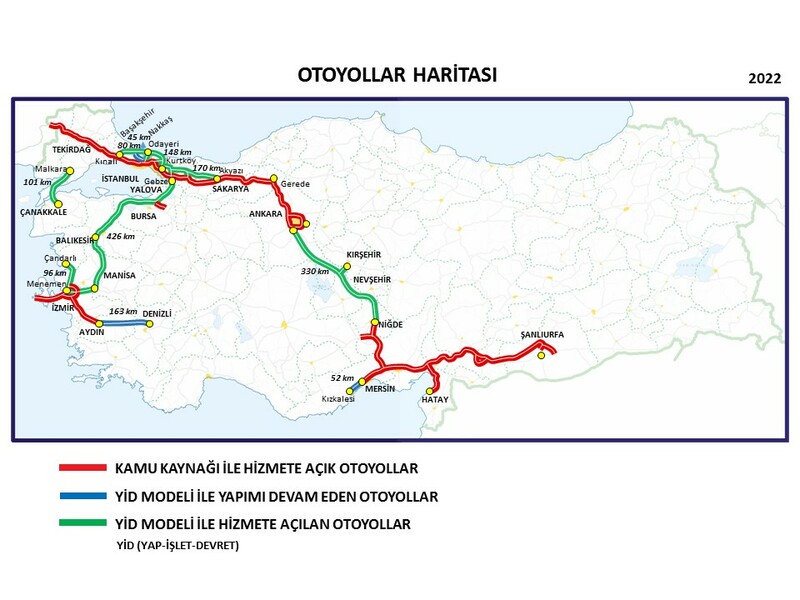 section Kinali - Mahmutbey is for 3,50 TRY / passenger car. You can find pricelist on the link under.